What is a blogger to do when she can’t think of anything to write? (This especially applies to the crazy bloggers who challenge themselves to post every day for a year.) She posts another list, that’s what. Favorite song: This is a tough one. I love music, and have an appreciation for all types. Just today, I was listening to this, this, and this; all similar, I suppose, thanks to my undying devotion to a local radio station (my kids rock out to the Ramones, Jake Bugg, and Alt-J because they have grown up with this station…way cool). There are really too many songs to consider, so I guess I will skip this one. Favorite color: This is also a tough one. My favorite color to wear is black, and that’s just because I think I look nice in it. I really can’t choose just one color, so I’ll steal Addie’s answer to this question: rainbow. Favorite tv show: Right now, we’re back to watching Mad Men (hellooo, Don Draper! ), and I also enjoy watching Anthony Bourdain: Parts Unknown. (All I need now is for Brian Williams to get a Sunday night program and I could watch all my television boyfriends on the same night!) I have no problem admitting that I have a sick obsession with watching reruns of favorite sitcoms (Friends, Everybody Loves Raymond, The Big Bang Theory). Favorite ice cream: Hands down, a trio of Jeni’s Salty Caramel, The Buckeye State, and Dark Chocolate. Perfection in a bowl. Ok, I’m done with this. The more I write, the cheesier I feel, and I’m also realizing that I don’t really have strong favorites of anything (well, except for maybe ice cream). Do you have any favorites that you feel compelled to share? If nothing else, I posted something for today, therefore keeping my streak intact. Go me. What a busy week we’re having! 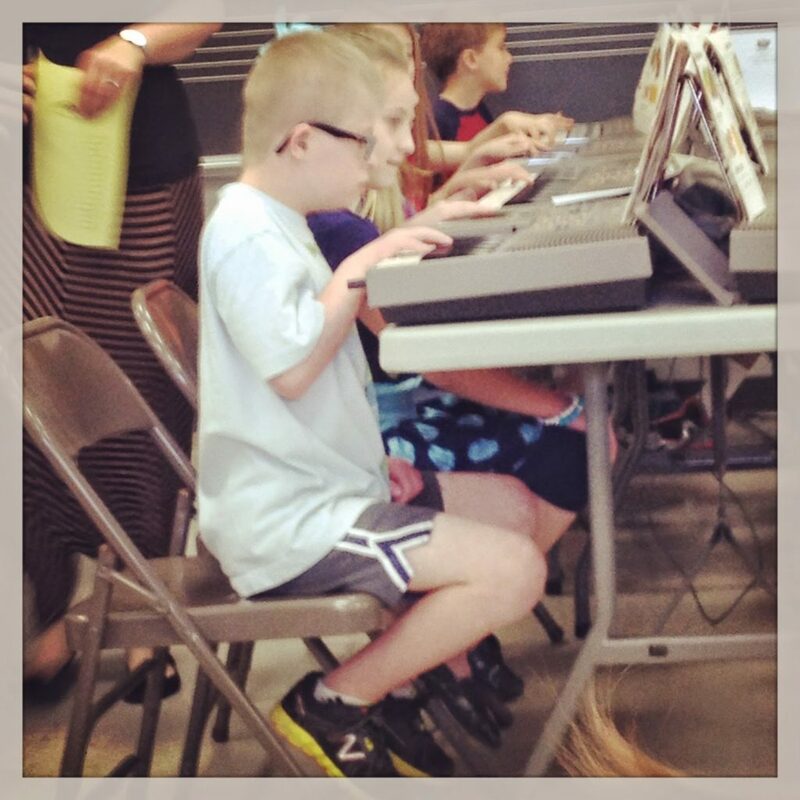 Yesterday, Alex’s third grade class presented a keyboard recital. They’ve been working very hard for the last several weeks, and they all did a great job. I was most impressed that they all bounced out of their seats to perform a solo or duet, without the slightest trace of nerves. That is such a great experience for them! I was very proud of Alex; his love of music certainly shines through performances like these. 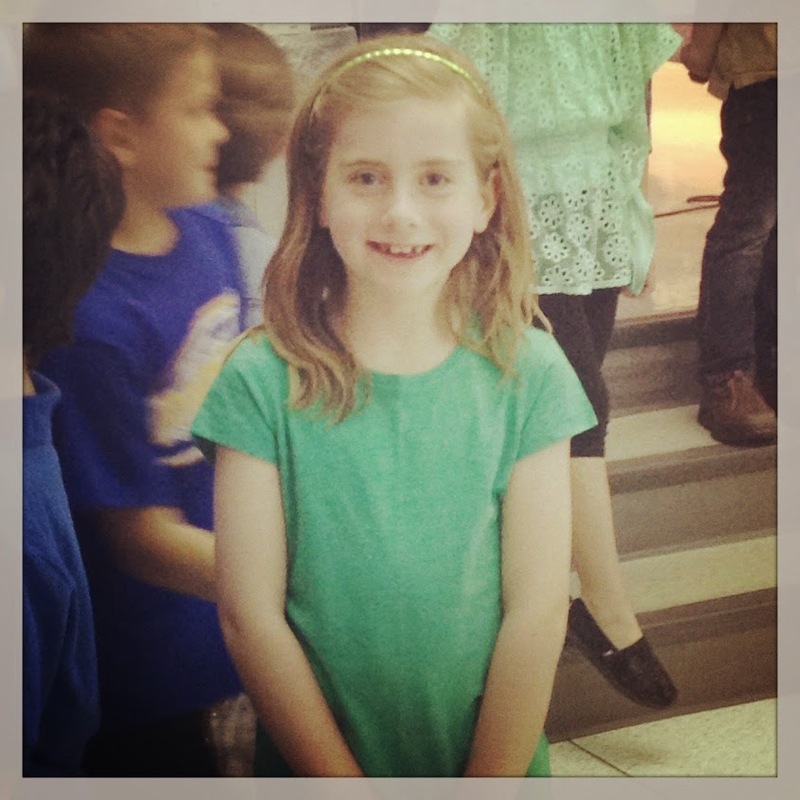 Tonight, Addie and her second grade peers presented a musical for Earth Day (after Al’s track practice, no less!). What talent in that group of kids! It was a joy to see all the little personalities on stage. Addie loves to sing, and she was very proud that she got to be the “dancer” in the game her class played on stage (as opposed to a “tree”), and she just beamed throughout the performance. After the musical tonight, I was talked into a trip to the school’s book fair. As much as I love seeing the kids’ excitement over books, I was not entirely thrilled to be stuck in a small room with a hundred other people and my cranky kids. Ugh. But, we made it out alive and that’s what counts, I suppose. This afternoon, Alex began music lessons. I noticed a Facebook post on a local networking board, and when I checked out the website, I was immediately intrigued. Alex has always loved music. He enjoys singing, dancing, playing instruments; all aspects of music really appeal to him, and we’ve always tried to encourage that. So far, I think we’ve done a pretty good job of that. He takes dance classes and sings with the children’s choir at church; the only thing that was missing was music lessons. I’ve hesitated with lessons in the past because I didn’t think we could find anyone who would just let Alex explore and enjoy whatever instrument was put in front of him. I didn’t want another recital, or more testing; the kid just wants to play music. After reading the philosophy of the music teacher who posted on Facebook, I thought we had hit the musical jackpot, and we were really excited to get him started. Even better, the teacher is just as excited to work with Alex. Sometimes, it’s really cool how things just seem to work out. Alex sat with him today and played different notes, in different sounds, on a keyboard. He loved it! After the lesson, when I was talking to Al about the next lesson, he said that his teacher was going to bring a guitar. “I love that!”, he said, beaming, and then bounced off to play basketball. I look forward to seeing (and hearing!) how Alex progresses in his lessons. It should be a fun ride!